You’ve probably heard the chatter in the media around alternative work arrangements, with many of these shifts due to advances in technology. In our industry, many advisors have considered implementing a work-from-home policy or have been approached by employees interested in working remotely. So, the big question is: Should you let your employees work from home? Of course, as with any human resources question, there is much to consider before taking action. If you jump into a telecommuting arrangement without first doing your research, it can introduce new challenges to your employee relations, especially if it’s not well planned or documented prior to implementation. In short, you must think before you leap! Understand the why. If an employee would like to work remotely, have a conversation to understand why he or she is requesting this arrangement. The employee’s needs might be met with a flexible work schedule, for example, rather than telecommuting. If you understand the reasons behind these requests, it could lead to an alternative solution. Review your service model and the job description. Do the employee’s job duties and responsibilities allow him or her to work remotely? How often the individual touches clients will be key to understanding whether his or her work can be performed off-site. Consider past performance reviews. Since working remotely requires personal accountability, ensure that the employee has consistent, positive performance reviews. An employee’s tenure with the firm could be another consideration. A remote arrangement should be allowed only for employees who have exhibited positive personal and successful work habits. Evaluate resources. Does the employee have the tools, technology, and resources to complete work remotely? This includes, for example, a quiet space free from the distractions of animals or children. The way that you work with your employees is also part of the equation. If your regular communication style includes face-to-face check-ins, having remote employees might not be right for you. You'll also want to keep in mind that technology, although it provides efficiencies for our work, changes communication between employee and advisor. How will you react when you’re not able to reach your employee through the same medium throughout the day? Your employees get more from their jobs than compensation and benefits. Social interactions that occur in the office provide comradery and reinforce your firm’s culture with employees, clients, and vendors. For socially driven employees, being remote can be a challenge. Others may be more productive working outside of a traditional workplace, especially if they are easily distracted. Understanding your employees, including their motivations and behavioral tendencies, will be key to assessing if a remote situation could be effective for them. After you’ve drafted the policy, schedule a face-to-face meeting with the employee to go over it from start to finish. Discuss your expectations and be prepared to answer any questions the employee might have. If the employee is fully on board with the policy, it’s time for a trial period. Be sure to provide consistent feedback on performance during this time. If the arrangement becomes a burden on your business or doesn’t work for any reason, discontinue. If, on the other hand, an employee has a successful trial period, discuss why it was a success and make changes to your policy as appropriate. Your business is built on relationships, and your employees play a vital role in reinforcing those relationships through their interactions with your clients. A successful telecommuting policy is one that will allow you to maintain your service levels while providing your employees the flexibility that is often not available in a larger firm. Ultimately, allowing your employees to work from home may help your business image and demonstrate to your staff that you are open to adopting new policies. Just remember, working from home is not appropriate for every employee or office: Be sure to look before you leap! Do you offer your employees a work-from-home option? 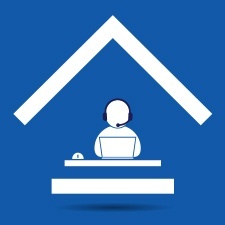 Do you have a formal telecommuting policy in place? Please share your thoughts with us below!